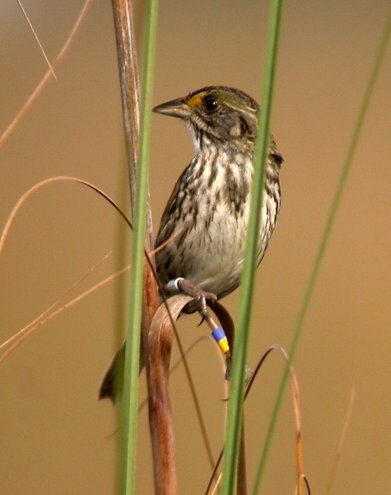 The endangered Cape Sable seaside sparrow (CSSS) (Ammodramus maritima mirabilis) is one of eight remaining subspecies of seaside sparrow. The CSSS once ranged throughout freshwater and brackish marsh habitats in southern Florida; the current known distribution is restricted to six separate subpopulation areas (A through F) in Everglades National Park. Changes in habitat and hydrology threaten the CSSS with extinction, and efforts by regulatory and water-management agencies to protect and increase populations have been of limited success. The sparrows build their nests on the ground and up to six inches (about 17 centimeters) above the ground in mixed marl prairies. To increase nesting success, these short-hydroperiod prairies must remain mostly dry during the nesting season (March through July). 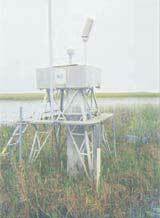 Previously, a single water-level gage was used to estimate water depths in one or more subpopulation areas. 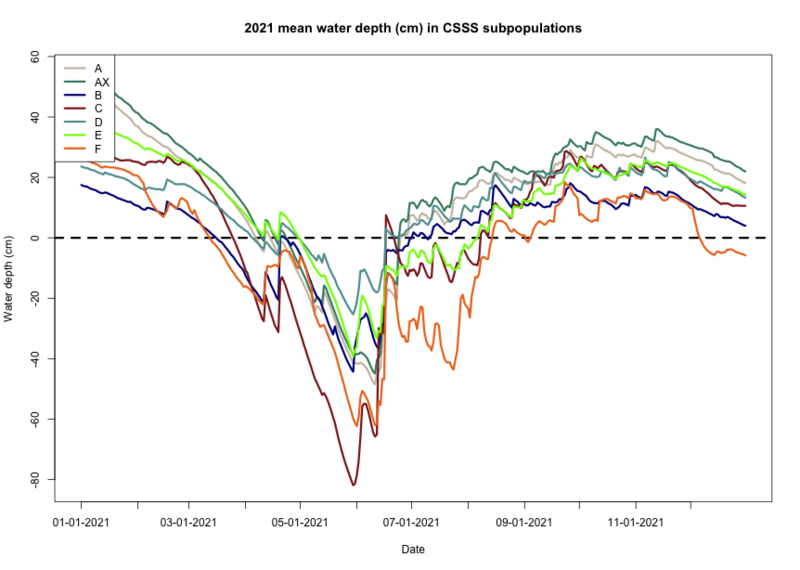 Recently, several water-level gages used to estimate water depths in CSSS habitats were discontinued following a reduction in funding. An alternative and improved method for estimating and evaluating water depths was needed. The Everglades Depth Estimation Network (EDEN) provides daily water-level and water-depth surfaces for the freshwater Everglades for the period 1991 to current. The CSSS Viewer was developed to use these surfaces to estimate and evaluate water levels and water depths in CSSS habitat on a real-time basis. An animated viewer shows flooded areas and calculates 1) the percent area that is dry, 2) the percent area having water depth less than or equal to six inches of water, and 3) the percent area that has been dry for 90 days for more (baby birds are fledged from the nest in about 90 days), each day by subpopulation areas. Wildlife-resource scientists and managers can use the CSSS Viewer to assess impacts on nesting success and develop management strategies for the future. Water-control managers can use these results to manage movement of water through water-control structures and, when possible, reduce flooding in these areas during the nesting season. This application of the EDEN water-level and water-depth data demonstrates how scientists and resource managers can use EDEN to analyze the effects of water management practices on vulnerable species in the Everglades. Please send any questions or comments to the EDEN team. 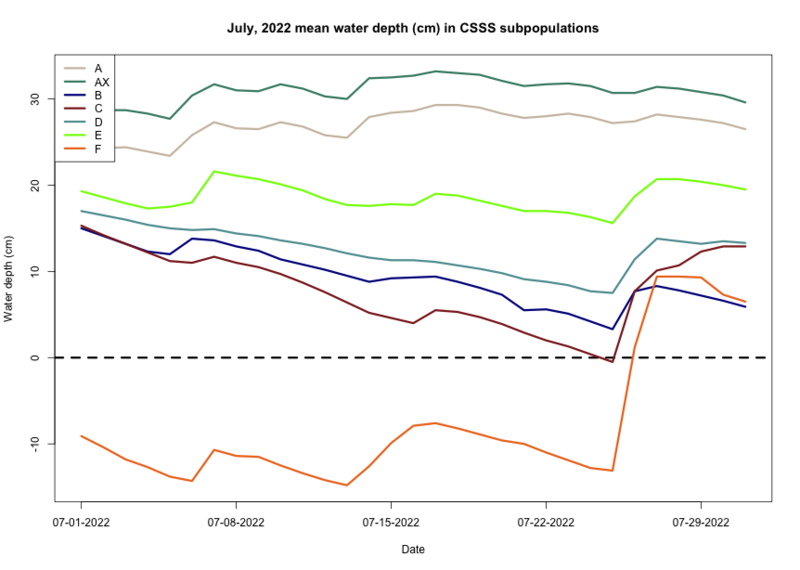 The CSSS Water-Depth Maps contain daily water depth based on the daily EDEN water-level surfaces, which are generated each day using water-level gage data, and ground elevation data. 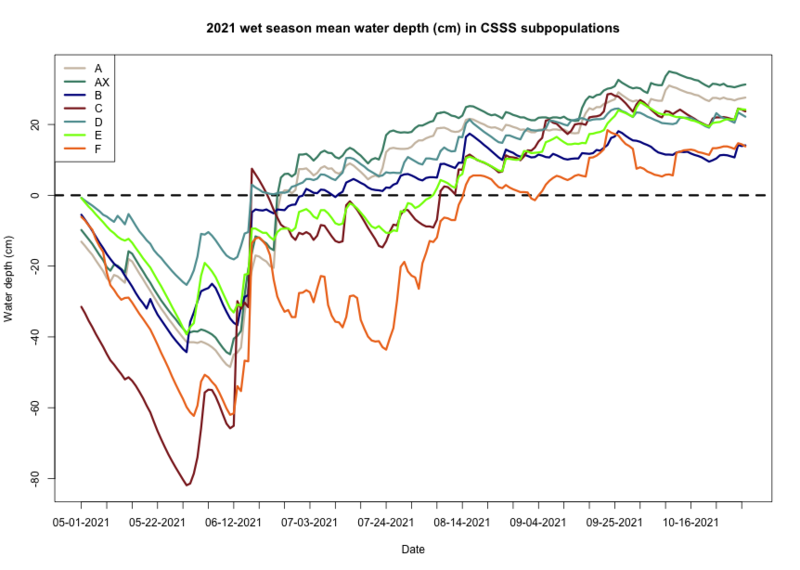 Water-depth values are displayed in both centimeters and inches (relative to North American Vertical Datum of 1988 (NAVD 88)). The data is served using the same 400 meters by 400 meters grid as other EDEN data. See details below ("Quality water-level data used to generate the daily water-level surfaces") about the daily water-level surfaces based on the quality of the water-level gage data. Water-depth value ranges have been pre-selected for this version. To set the water-depth transparency level, move the slider from left (full transparency) to right (no transparency). Time periods have been pre-selected based on anticipated user needs for this version. To change dates, select the data range from the top drop down box. Once the time period is selected, the maps begin to load into the viewer. The status of the loading process is displayed in the bottom left of the viewing window ("Loading image..."). All of the daily maps are viewable when the status is 'Loaded'. The map view can be animated using the arrow button which toggles the animation on and off. The Time range slider allows users to move quickly between maps without using the animation button. The ground elevation allows users to see the topography of dry areas. To set the ground elevation transparency level, move the slider from left (full transparency) to right (no transparency). The four-year hydroperiod allows users to see the mean and standard deviation of annual hydroperiods. Mean four-year hydroperiod for a named year is the average yearly days where the water level is >0 for the previous four years (e.g., 2017 mean four-year hydroperiod is the mean of 2013-2016). Standard deviation is of the mean of those four years. To set the hydroperiod transparency level, move the slider for water depths from right (no transparency) to left (full transparency) and the slider for the hydroperiods from left (full transparency) to right (no transparency). You may step through the annual hydroperiod means or standard deviations using the left and right arrows. Gages will display on the viewer by checking the box next to "show gages." Deselecting the box will remove the gage markers. Current hydrographs at each gage can be viewed by clicking the gage pin on the map. Several computations by subpopulation area are computed and displayed by clicking the boxes next to the items listed below. More information about these computations can be found by clicking on the linked text for each item. NOTE: Portions of subpopulation areas B, C, and D are outside the EDEN model domain. The percentage of area computations includes only the subpopulation areas within the EDEN model domain. A CSV file of the subpopulation area statistics used in this application can be downloaded here. Or download the latest year-by-year dry conditions PDF report here. 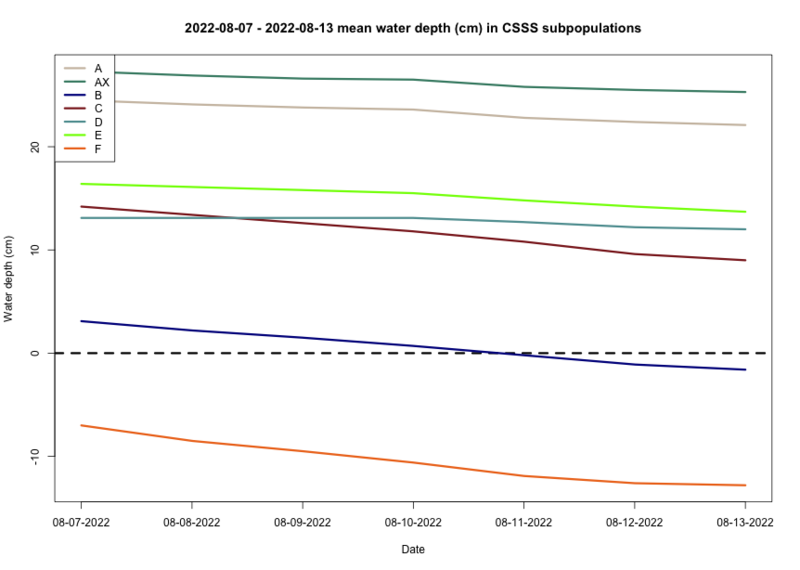 mean water depth is the average cm water depth of the pixels of the subpopulation area. 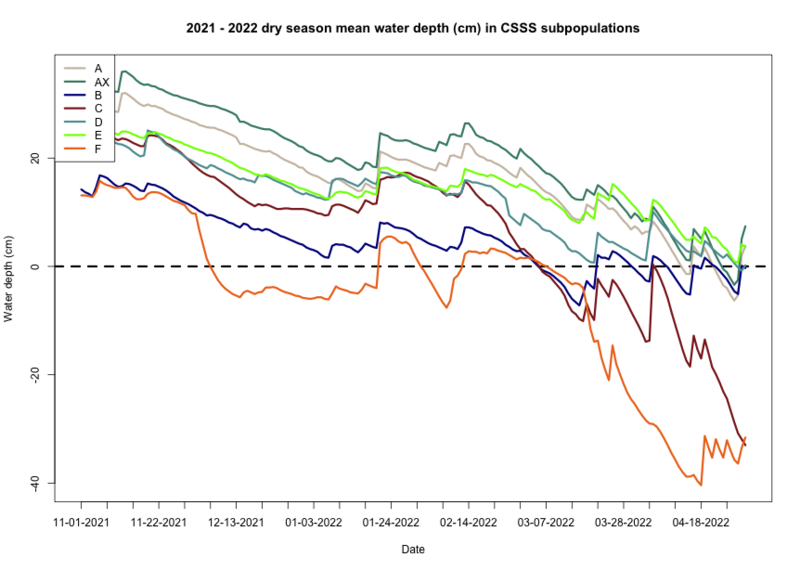 Graphs of the subpopulation mean water depths are available for the previous year, wet season, dry season, month, and week. Coordinate information — clicking on the map once displays lat/long information. Water-level surfaces for the most recent quarter are based on real-time gage data. Real-time water-level data for the gages are transmitted daily by satellite or other telemetry and have received little or no review from the operating agency. The EDEN team uses the ADAM software to quality-assure the data and estimate missing data. Subsequent reviews and edits of the data may result in significant revisions to the data. Water-level surfaces for all previous quarters in the current water year (Oct 1 to Sept 30) are based on provisional gage data. Provisional water-level data for the gages are provided on a quarterly basis from the operating agencies and have received some review and edits by them. For some agencies, the review is near final while for others, the review is preliminary. Then, the EDEN team uses the ADAM software to further quality-assure the data and estimate missing data. Water-level surfaces for the water years prior to the current one are based on final gage data. Final water-level data for the gages are provided on an annual basis from the operating agencies. The EDEN team uses the ADAM software to estimate missing data, if necessary. Summary statistics for the Cape Sable seaside sparrow critical habitats, showing percent of subpopulation areas dry during nesting season (March 1 through July 15) for at least 40 and 90 consecutive days; percent of subpopulation areas with discontinuous hydroperiods during the calendar year of 0 to 89, 90 to 210, and > 210 days; and mean four-year hydroperiod and standard deviation. A CSV file of these statistics used in this application can be downloaded here. New: Popup statistics graphs now available; click column headings (e.g., "≥ 40") to view.